The 31′ Hurricane 31H has 2 slides; one in the living area and one in the rear bedroom. The bathroom is located int he hallway, and has an entrance door from the hallway as well as directly from the rear bedroom. This is an ideal unit for those looking for the most bathroom and bedroom privacy. The unit has a dinette that folds into a bed, a futon style couch, and a rear queen bed. The 31D will sleep 4-5 in 3 beds: Bedroom, Futon style Sofa, & Dinette. 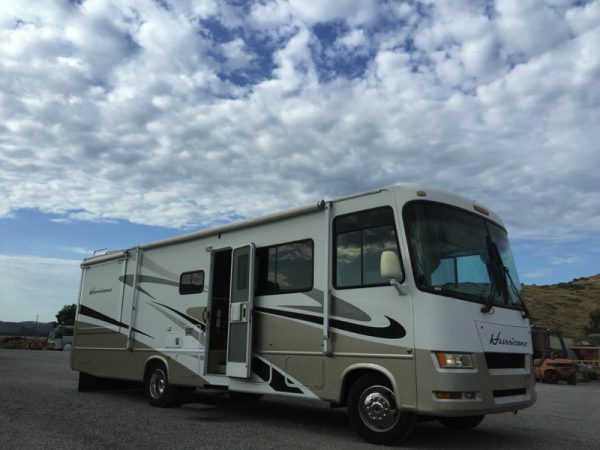 This is a simple motorhome, easy to use compared to more advanced models.